"We're willing to accept even Rs 100 as deposit. We'll go to the doorstep of people to garner deposits"
Chandra Shekhar Ghosh gave up a steady job at BRAC, the well-known Bangladesh-based NGO, to start his own which later metamorphosed into Bandhan Financial Services. Q. 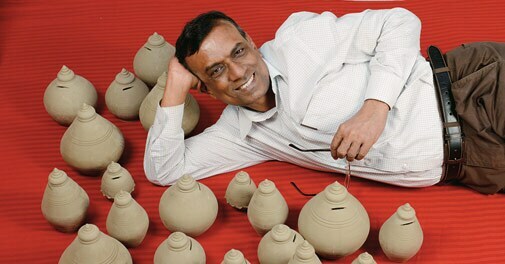 How did you transform Bandhan from an NGO to a non-banking finance company? A. As an NGO, our only source of funds was donors' money. In 2005/06, we converted ourselves into an NBFC. India is a big country and we also had big plans. I wanted to scale up my operations. Scaling up has two kinds of impact - first, the cost of operations comes down. Second, until I reach a large number of people, I make no impact on the community. So, these factors encouraged me to go for an NBFC model. We also needed more money to reach out to more people. Banks are also happier funding an entity if it is an NBFC. In fact, we were functioning as an NBFC even though we were an NGO. Q. When did you feel you wanted to turn into a bank, and why? A. In 2009, I felt the need to scale up. The unbanked population in India is still 60 per cent. Banks also have limitations in giving loans to poor. The issue was how I can give loans at a comparatively low interest rate. Our borrowing rate (from banks) was high, so we were passing it on to the customers. If we get the opportunity to access low-cost deposits, our cost of funds would also come down and I could pass the benefit on to the customers. Q. Why don't existing banks do this? A.Existing banks have other skills. They are tapping customers at the top of the pyramid. It will take them time to come from the top of the pyramid (large corporate houses) to the bottom of the pyramid. Q. Your expertise lies in lending. How do you plan to build a deposit franchise which requires different skills and probably different markets? A. We have 5.5 million borrowers as customers. We can easily convert them into deposit account holders. There is no bank which has 5.5 million customers from day one of commencing business. Secondly, we are working within a community which knows us. We are very transparent in our dealings. For example, we hold meetings with borrowers in villages every week. People trust us. Q. Bankers say rural markets are more of lending markets and large deposits can only be raised in urban areas. A. If we want to develop India, we should break the mental blocks in the minds of people. I remember a villager coming to Apollo Hospital and settling a bill of Rs 1 lakh in cash. People in villages also have money, but nobody has gone to them to tap it. It's not like you set up a shop and expect customers to come to you. You have to go to them. Q. PSU banks are already present in rural areas, but people there prefer to deal in cash. People don't use cheques or cards. How do you plan to break this mental block? A. Of course, there is some fear in people's minds because of the tax implications (of using cheques and cards). You have to educate them about the advantages of keeping money in a bank. The second part is doorstep banking. We are willing to accept even Rs 100 as deposit. We will go to the doorstep of people to garner deposits. The staff should be customer friendly and motivated to work for the benefit of the community. Q. Will your business model change to become a bank? A. We will gradually expand the customer base from women to all types of people. We will do both doorstep as well as branch banking. A customer won't come to your branch to deposit Rs 50, when he has to spend another Rs 30 on travelling. We can also continue doorto-door instalment collection on a weekly, fortnightly or monthly basis in a banking step up. Our model is a financially viable model. We have already proved it. Q. How will you fulfill banking regulations relating to collateral, priority sector, SLR, CRR etc? A. We will not seek collateral for loans up to a certain amount. But we will ask for collateral after that as per banking rules. We will also do SME and other business loans. Today, our entire portfolio comes under priority-sector lending. We are fully compliant with the RBI's priority sector lending. We only need to meet SLR and CRR requirements. What next at ZEE as Subhash Chandra passes the baton?